Fast, accurate, scalable and proven shipping software for growing business that want to impress customers with the speed of packaging and delivery. 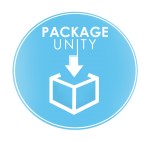 PackageUnity is the NetSuite compatible service that enables companies to automate their shipping, labelling and export documentation. Already used to deliver hundreds of thousands of packages and documents each year, PackagingUnity conveniently provides access to multiple or single courier companies such as Parcel Force and DHL. Get delivery details right first time, every time. Up to 200 packages at any single moment. Track packages & keep customers up to date.